Drum Corps International staff members, along with members of the Advance Resource Team of the Indiana Convention and Visitors Association's Music Crossroads Initiative, were joined this morning by representatives from the Bloomington Convention and Visitors Bureau for another in a scheduled series of detailed planning meetings and stadium tour at the site of the 2008 DCI World Championships at Indiana University's Memorial Stadium. Over the past week, the greater Bloomington, Ind. area has been slammed by severe thunderstorms and a tremendous amount of rain which has left much of the region underwater, causing more than $1 million in damage to the Indiana University campus, according to the Associated Press. At the center of interest to DCI executives and event staff, and to the tens of thousands of fans of Drum Corps International's competing units preparing to descend on Central Indiana this summer, is the condition of the playing field which also was damaged due to the flooding. 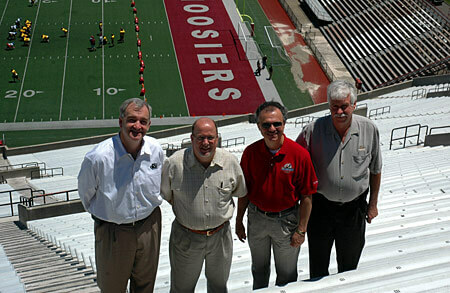 "Since last Friday's announcement of the damage to the Memorial Stadium playing surface, we have been in very frequent and direct contact with Indiana University officials who have assured us that they understand the significance of our event, while expressing their obvious and sincere commitment to ensuring its overwhelming success," explained Dan Acheson, DCI executive director and CEO. "It's 'all systems go and full speed ahead' from here on out," Acheson said, "and the incredible teams of dedicated professionals in Indianapolis and Bloomington are working together to provide an exceptional experience for fans and participants alike. From the first Open Class qualifying event in Michigan City, through the Individual & Ensembles competition in Indianapolis, to the five events scheduled over our three days in Bloomington, there is no doubt that the entire Hoosier State is poised to welcome Drum Corps International to Indiana for what is shaping up to be a spectacular conclusion to the 2008 DCI Summer Tour." Acheson was joined at the meeting by some 15 DCI representatives, including day-of-event manager Dale Antoine, Open Class coordinator Dave Eddleman, and corps housing coordinator Jeff Cox. 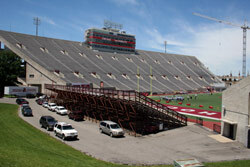 Serving as a backdrop to the discussions, more than 95 yards of the field were in use by a scholastic football camp, while stadium officials continued to assess the damage in preparation for the upcoming repairs. Order your tickets to the 2008 World Championships in Bloomington, Ind. Book your hotel room for the '08 World Championships.